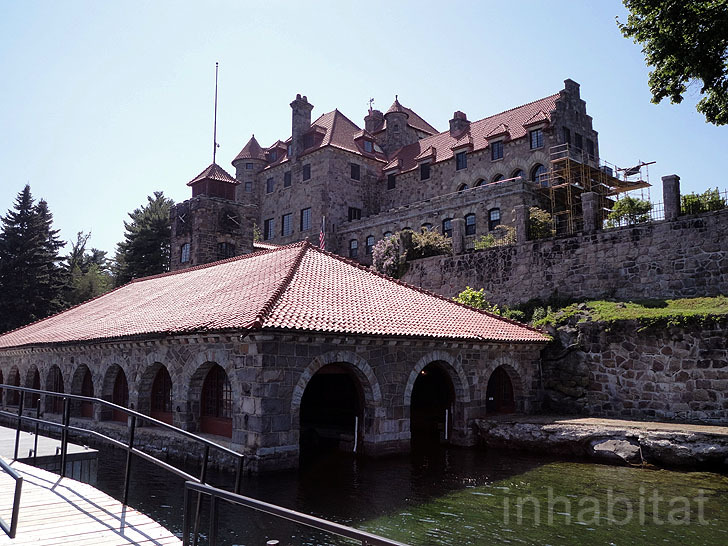 Spend a Night in a Historic Castle on a Private Island in Upstate New York! 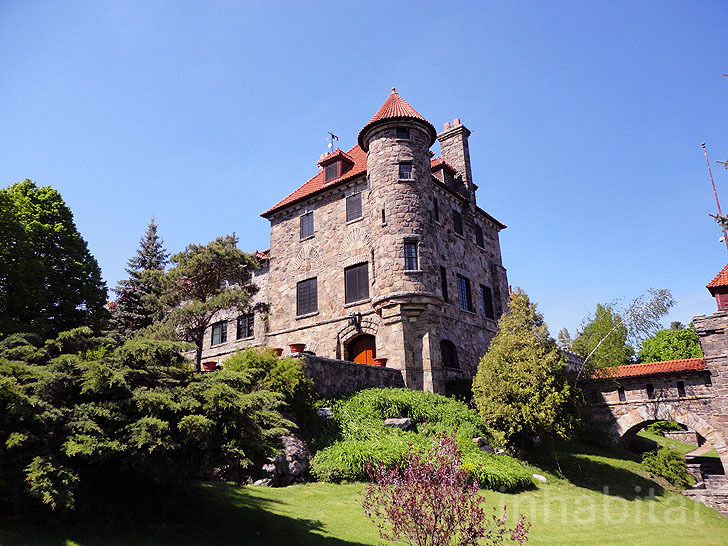 <a href="http://www.singercastle.com/" target="_blank">Singer Castle</a> is a historic castle on Dark Island in the 1000 Islands region of the St. Lawrence Seaway that was once enjoyed by the wealthy Bourne family -- and it can now be enjoyed by you too! 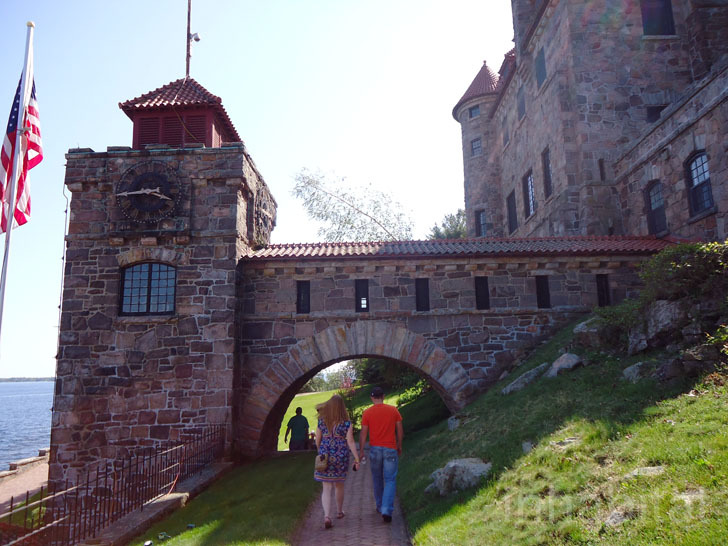 The red-roofed castle was built in the early 1900s and was truly a place where servants were not seen or heard, complete with secret passageways, underground tunnels and two-way paintings. The 28-room villa is set atop a <a href="https://inhabitat.com/joysxee-is-a-real-eco-paradise-island-that-floats-atop-garbage/" target="_blank">lush hill on a private island</a>, overlooking the St. Lawrence Seaway in Upstate New York, and has one suite for overnight guests to experience a truly one-of-a-kind escape. 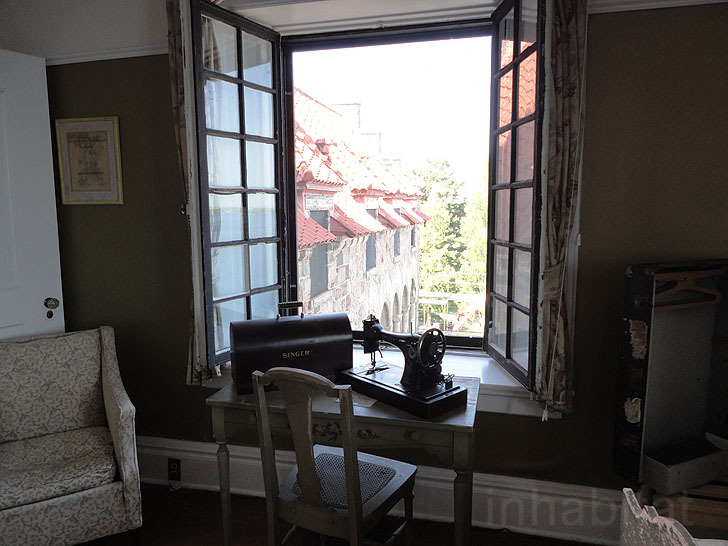 <a href="http://en.wikipedia.org/wiki/Frederick_Gilbert_Bourne" target="_blank">Frederick G. Bourne</a> was the fourth president of the Singer Sewing Machine Company, and built this “<a href="https://inhabitat.com/kitchy-faux-bear-skin-rugs-are-perfect-for-animal-lovers/" target="_blank">hunting lodge</a>” for his family, guests and a bevy of servants. 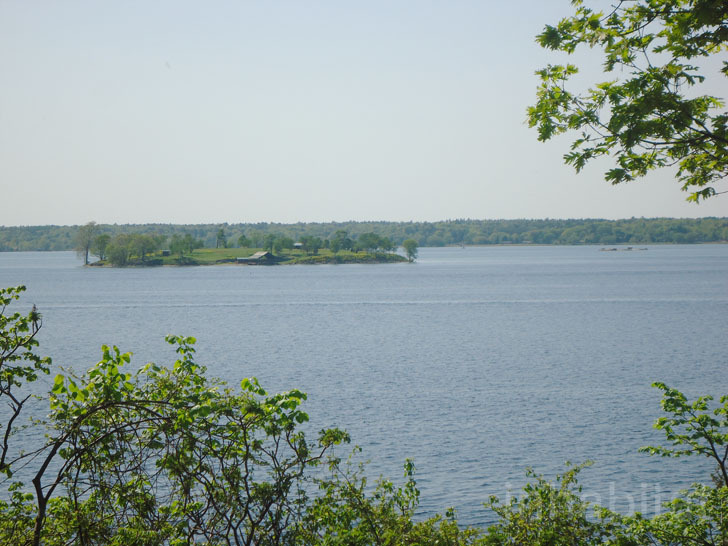 They enjoyed many summers here, away from the city, until the late 1960s when the property taxes became too much for the last surviving heir to bear. Since then, the castle was an academy for Naval students, then became abandoned for several years, before it was purchased by the current owners, who began renovating the property back to the Bourne’s initial vision. The ground floor of the castle was designed in <a href="https://inhabitat.com/luminous-windscape-pavilion-sways-and-morphs-with-each-passing-breeze-in-lacoste-france/" target="_blank">true Medieval form</a>, complete with stone archways, knights, iron candelabras, and rich textiles. 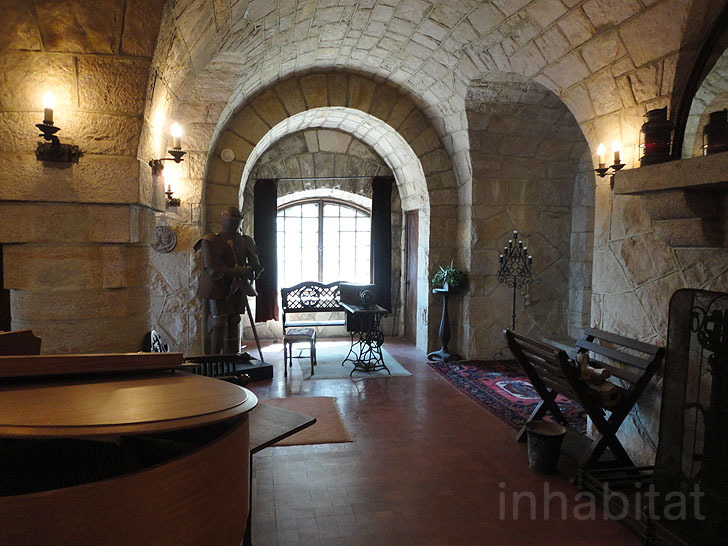 The piano room is flanked with a terra cotta wine cellar, which natural keeps the wine cool. 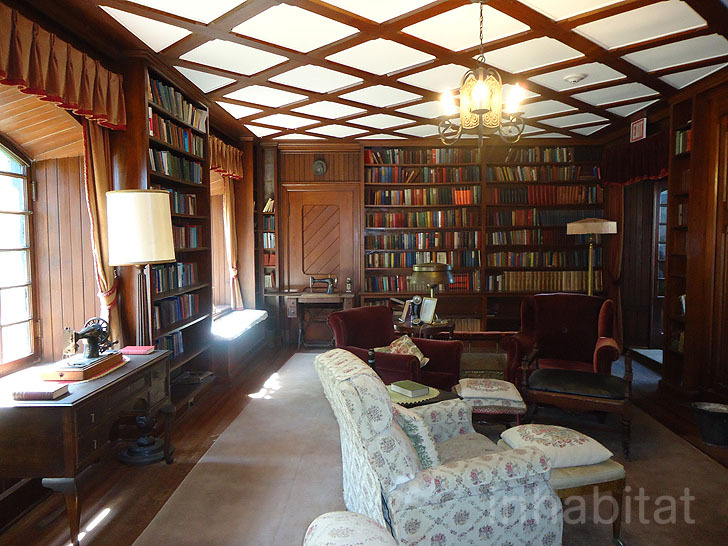 The ground floor also has an incredible library with historic volumes, as well as a music room with vintage Victrola and another <a href="https://inhabitat.com/brc-designs-unveils-amazing-piano-key-chair-at-icff/" target="_blank">piano</a>. 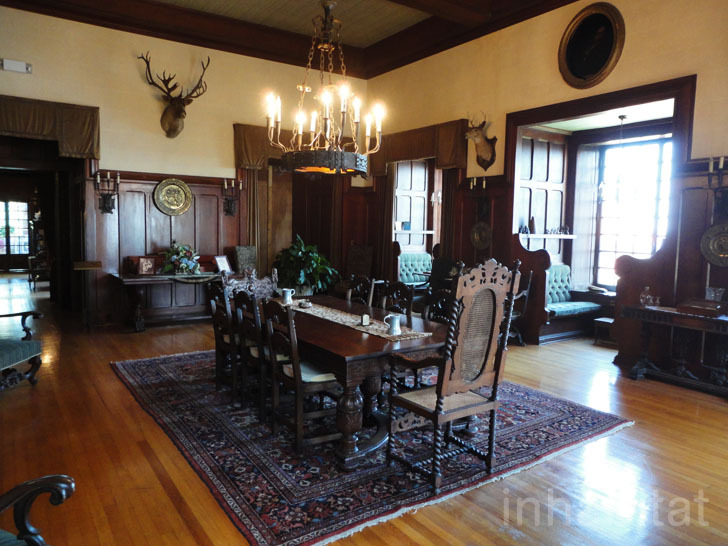 Upstairs is a formal dining room, which has private banquettes modeled after passenger trains. Each compartment was meant for private drinking, gaming, or to look out at the beautiful views in solitude. As if out of a movie, a <a href="https://inhabitat.com/hong-yi-paints-an-incredible-portrait-using-coffee-stains/" target="_blank">painting</a> in the room is revealed to have the eyes cut out- this was so the servants could pass in a secret passage behind the room to look down on the table to see if any service was needed, without disrupting the meal. Bourne also had a tiny office off of the dining room for when duty called. 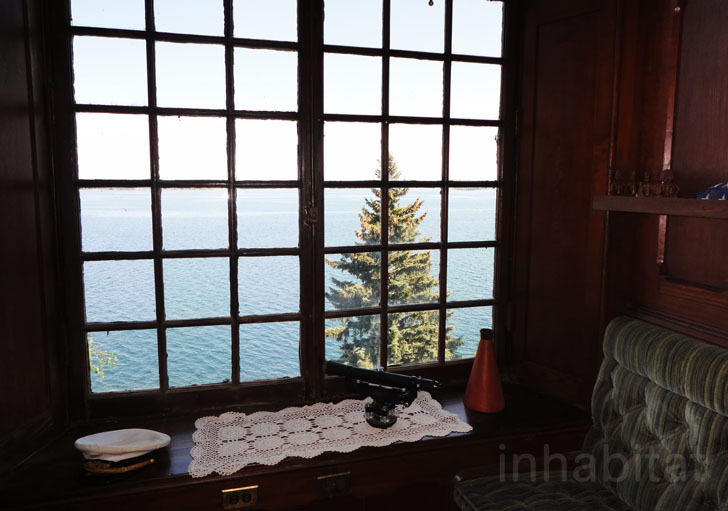 The breakfast room was enclosed in glass so that the Bournes and their guests could watch the American sunrise to one side, and the Canadian sunset on the other, as Canada is just across the channel. At night, the tables were cleared for dancing under the stars, which shone through the<a href="https://inhabitat.com/xieria-house-ii-is-a-light-filled-modern-home-in-portugal-that-harmonizes-with-the-surrounding-landscape/" target="_blank"> glass curtains</a>. The Bournes guest rooms and suites were capped off with the ladies dormitory for servants, which features a unique bathroom. The skylight room also has a frosted glass floor, so that the bathroom below it may also benefit from the <a href="https://inhabitat.com/shady-asmacati-shopping-center-features-a-beautiful-perforated-leaf-facade/" target="_blank">natural light pouring into the skylight</a>. The servants prepared sumptuous meals from extremely local foods- grown on the next island over, which Bourne purchased so he could grow fresh food for the castle. For the guests adventurous enough to sleep over, <a href="https://inhabitat.com/aerial-photos-reveal-that-dubai-is-building-a-series-of-dubai-shaped-islands-off-the-coast-of-dubai/" target="_blank">the island</a> is their private getaway after tourists leave at 6pm. 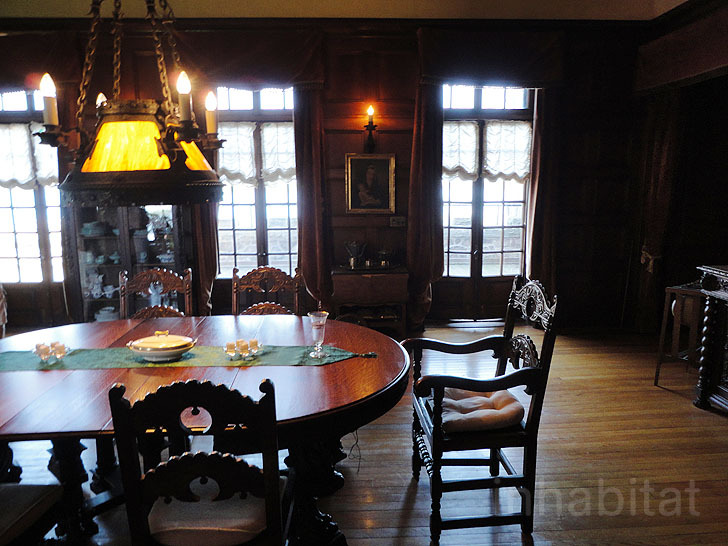 A<a href="https://inhabitat.com/photos-inhabitat-spends-the-night-in-quebecs-hotel-de-glace-made-entirely-from-ice/" target="_blank"> royal suite</a>, which mixes antiques with modern comforts, can sleep up to six people. Each guest is treated to an extended private tour of the castle, including all of the secret passageways, as well as a six course meal in one of the historic dining rooms. The grounds used to hold a <a href="https://inhabitat.com/world’s-highest-tennis-court-was-a-green-roof-atop-the-burj-al-arab-in-dubai/" target="_blank">tennis court</a>, but are now lushly planted for outdoor dining as well. 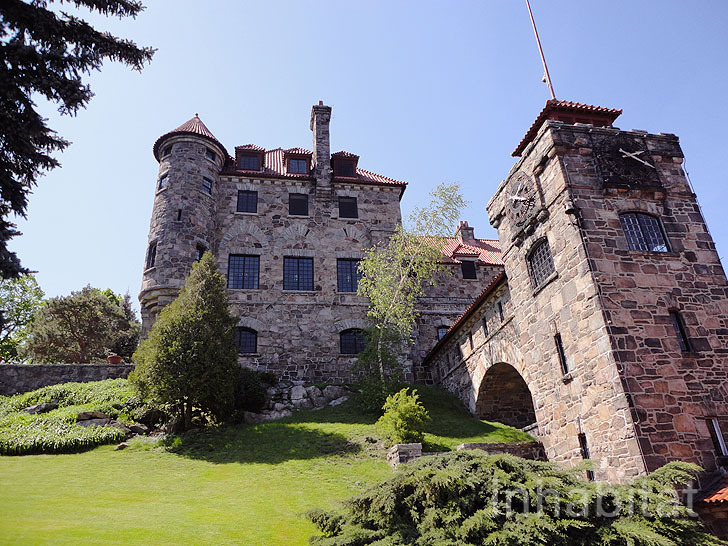 Singer Castle on Dark Island is not only a preservation of America’s opulent past, but also a unique getaway that combines history, luxury and the serenity of the beautiful St. Lawrence region. 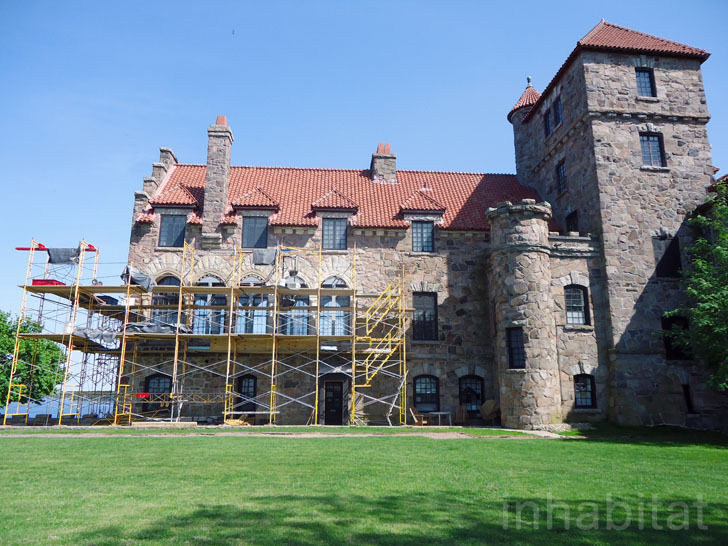 Singer Castle is a historic castle on Dark Island in the 1000 Islands region of the St. Lawrence Seaway that was once enjoyed by the wealthy Bourne family -- and it can now be enjoyed by you too! 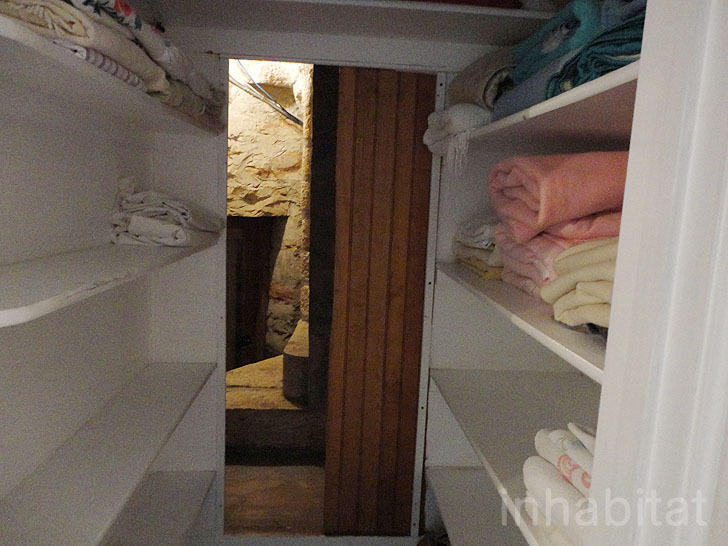 The red-roofed castle was built in the early 1900s and was truly a place where servants were not seen or heard, complete with secret passageways, underground tunnels and two-way paintings. 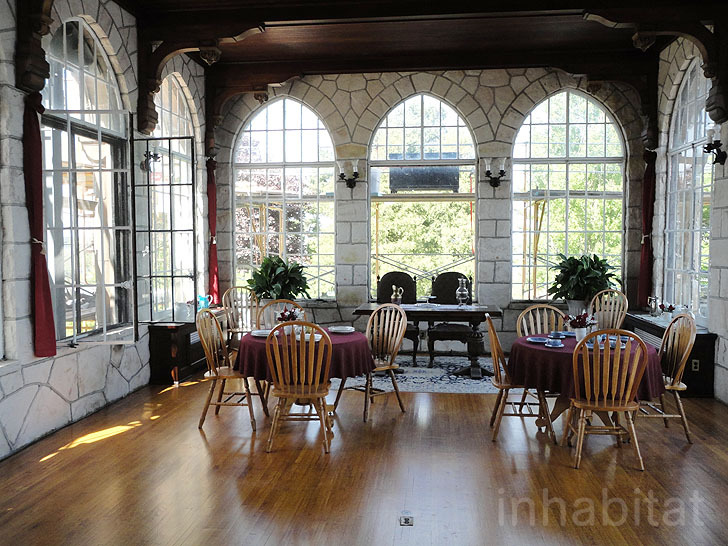 The 28-room villa is set atop a lush hill on a private island, overlooking the St. Lawrence Seaway in Upstate New York, and has one suite for overnight guests to experience a truly one-of-a-kind escape.